I do remember that after that road trip, I demanded a visit to Quincy to visit Adams National Historic Park and Peacefield. This spark of curiosity came full circle in the summer of 2016 when I was a graduate fellow at United First Parish Church in Quincy, aka the Church of the Presidents, the final resting place of Presidents John and John Quincy Adams. The story of America, in its proudest and most shameful moments, can be told through the history of the American president. The short four or eight (or, once, twelve) years spent as the president weave complex narratives of truths, lies, and compromise, failed and successful, and suggest ways the lives of these men (all men … so far) have affected the lives of other Americans. The story of America, in its proudest and most shameful moments, can be told through the history of the American president. Chronicles of the lives of American presidents can give us important insights. Whether it is Lincoln and his Baptist beginnings in Kentucky, or Andrew Jackson’s capture by the British during the Revolution, these events reveal what shaped them and, in turn, the history of the United States. What I have found most fascinating is the decision about where these men, so often consumed with the ideas of their own mortality and legacy, chose as their final resting places. Presidents are often buried where they were born or in a place of great significance to the life they led prior to the presidency – sometimes in grand tombs, at other times with the most modest of markers. It has become a joy of mine to visit these final resting places. I have yet to reach an impressive number (ten so far), but I’ve had the chance to visit a few graves which are not so obvious. 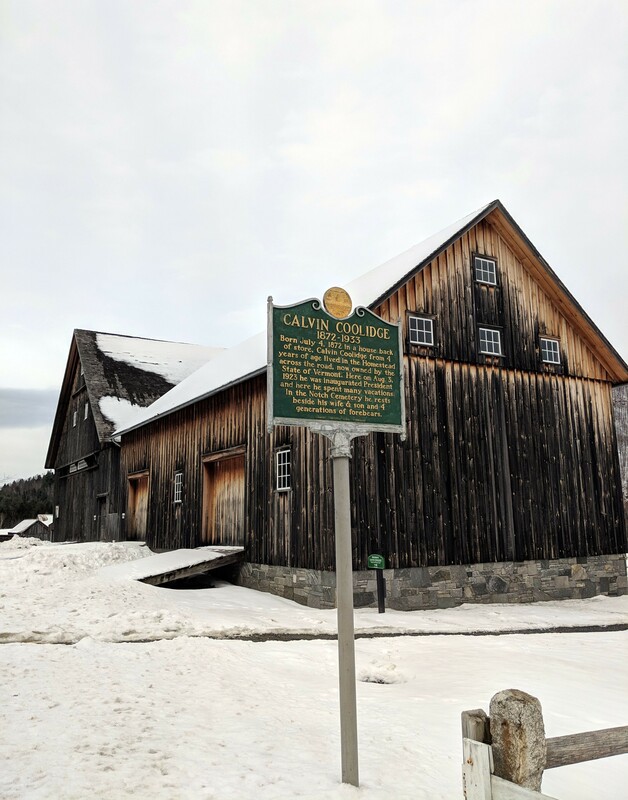 In November, while on a trip to Burlington, Vermont to visit family, we took a detour, winding our way through the snow-covered hills to the homestead and burial site of President Calvin Coolidge at Plymouth Notch, Vermont. 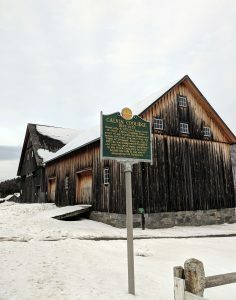 Calvin Coolidge … often spent summers at his family home in Plymouth Notch and was vacationing there when he received word of Harding’s sudden death. Calvin Coolidge, Governor of Massachusetts before being nominated to become Warren G. Harding’s vice president, often spent summers at his family home in Plymouth Notch and was vacationing there when he received word of Harding’s sudden death. The Coolidge family home was without electricity or a telephone, so the news came to him by messenger in the middle of the night on 3 August 1923. Coolidge was sworn in by his father, a notary public and justice of the peace, in their parlor at 2:47 a.m. President Coolidge then went back to bed. It was quiet at the homestead during my visit, with the visitor center and historic home closed for the season. It was so quiet that only one car drove by and I felt like an intruder. 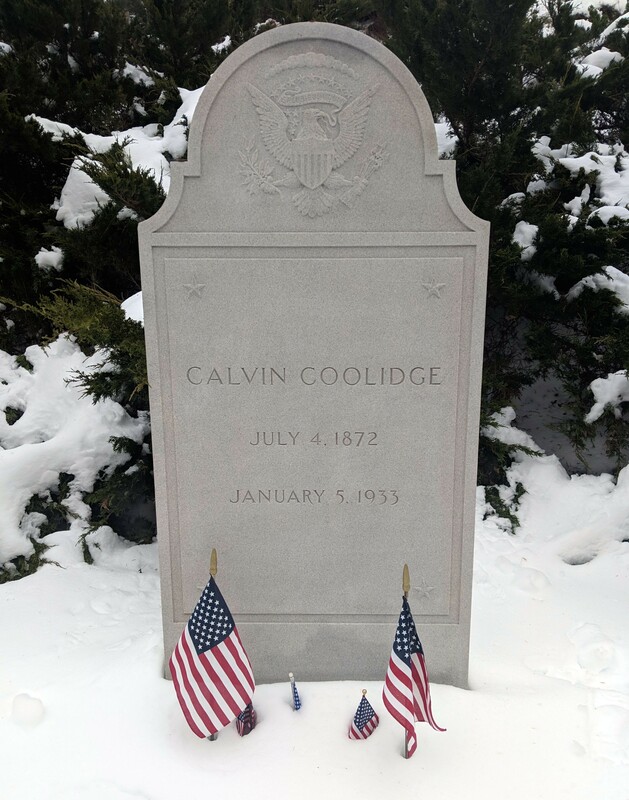 Calvin Coolidge, who died in 1933, is buried a short way down the road at Plymouth Notch Cemetery with his wife Grace and two sons. His youngest son Calvin Coolidge, Jr. died tragically in the White House at the age of 16 after suffering a staph infection in 1924, the discovery of penicillin still four years away. If you find yourself in Canton OH to see the McKinley Monument, etc., please let me know. I would be glad to meet you; I live in Akron OH. There are other presidential graves in Ohio I think. Danielle, you have the gift of the storyteller. Thank you for taking me along to Silent Cal’s. A very interesting read. Thank you! My husband and I missed visiting the Adams graves in Quincy because the church is closed on Saturdays…but we did get to meet “John Adams” at the JQ Adams birthplace, and we also got to tour the Dorothy Quincy Hancock House, so overall it was a win. However, the ranger who sold us our tickets to Adams National Historic Park was a little flummoxed when my husband said we were there to learn more about America’s sexiest president!! Thanks for enlightening us all about “Silent Cal” Coolidge, and for assuring us that not everyone is so blithely ignorant of our presidential history! Since 1949, when I got my master’s in history from the U of Chicago on an aspect of John Quincy Adams’s life, I have been fascinated with JQA and, indeed, the whole Adams family. JQA touched so many aspects of American history, more than any other man who became president, in my opinion. One illustration of his adherence to principle, in this case separation of church and state, was his insistence on taking the presidential oath on a book of constitutional law rather than a Bible. He was a loner in this. As an Adams descendant I have read volumes about the family, and JQA is my favorite historical character to whom I am related. Harold is correct, his life touched so much of American history that so many people don’t even realize. Abolition of slavery, rights of petition, and on and on. It’s unfortunate that his personality has left him unpopular as an historical figure. Reading his diaries is sometimes laborious but so rewarding – it’s like a Masters Degree read in American History! The Adams sites in Quincy and the Church are places every American should visit. I’d love to read your Master’s Thesis Harold, !!! Was it published? My 1949 thesis at UChicago was “John Quincy Adams, Slavery, and the Right of Petition.” My adviser was Avery Craven, who urged me to pull an article from it. However, I was on the road to broadening my social science perspectives and getting a doctorate at Syracuse U’s Maxwell School, so I never had time to write a scholarly article. Later, Stanley Elkins, in his book “Slavery” referred to my thesis in a footnote with very kind words. For the last 70 years I have retained my fascination with JQA. At last, in the last decade or so, many writers have “discovered” him, and my collection of books on him has grown considerably. In addition, Louisa Catherine has finally come into her own as a truly remarkable woman. “Mrs. Adams in Winter” is a wonderful slice-of-life picture, and there are now others, as I’m sure you know. I could go on. Bemis, in the preface to his JQA foreign policy book of 1949 [just after my thesis] put it beautifully: “In one lifetime John Quincy Adams had two notable careers, separated by an interlude as President of the United States.” No one could have put it better. Harold, thank you for your reply. You are right, JQA and Louisa have finally come into the limelight as they should have decades ago. I have a couple of the books about her, but not the one you mention, so I will get and read it. I am a Bemis descendant as well as Adams, so I’d like to read his book on JQA, especially as you have given that quote. What a succinct way to describe JQA. I would say he had 3 notable careers, that of surviving childhood – or nonchildhood we might call it. Abigail was a great helpmeet to John, but certainly an overbearing mother. Thank you again. As of November 2018, I had visited all the presidents’ graves; now there is one more to visit. Yes, the variety is most remarkable; Coolidge is probably the most simple – both stone and setting. McKinley, Grant, and Lincoln are the most elaborate. Interestingly, only one (Wilson) is buried in the District of Columbia; he is buried on the south side of the nave of the National Cathedral. There is a typographical error carved in the stone of the side of his tomb – look carefully at the wording on the New Jersey state seal (on the left as you face the tomb from the nave side). I sing in the Cathedral Choral Society (going on 41 years), and have walked past that tomb hundreds of times.